We've been observing Earth Hour for several years now (since 2008). I appreciate the message and the reminder that electricity is precious, something to be valued. At the same time, we also need to remember the price we, as a planet, pay for that resource. These days there seems to be so much emphasis placed on where and how we are going to get our electricity but not as much on conservation. I grew up in California and well remember the tremendous push to conserve during the 70s. We were making great strides in awareness and personal responsibility but that all fell apart during the 80s. I think it's time for each of us to renew our commitment to personal action on this important issue. I know I will be doing so. Anyway, David and I are going to enjoy Earth Hour with a fire in the fireplace (it's chilly and we still have a little firewood to use up), candles, wine, brownies and a game of Scrabble. 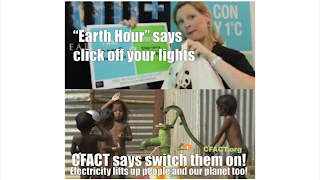 Do you observe Earth Hour? If so, what are your plans?